Transformation is another word for change. And like it or not, the data center is no more immune to transformation and change than is our daily lives. The physical infrastructure, the software, and the demands placed upon them both vary moment by moment, day by day. The 'dynamic data center' is always evolving to keep up with today's growing data demands. While the hardware side of the data center has changed, the software running and living in the data center evolved even more rapidly. Meanwhile, increasing compute workloads, growing storage demands, new applications, and societal impatience led to a throwaway mentality for much of the infrastructure that makes up the data creation and consumption ecosphere. That said, The WEEE Directive in the EU began changing the behavior of the data center industry starting in the early 2000s, and subsequent changes to WEEE that went into effect in 2014 further curtailed the amount of data center and personal electronics going into landfills around the world. 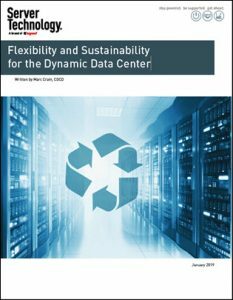 The new white paper from Server Technology, "Flexibility and Sustainability for the Dynamic Data Center," explores the roles that flexibility and reusability will play going forward in making decisions around engineering future data center designs, and how data centers continue to work on their environmental impacts by pursuing efficiency, reusability, and waste reduction.